The Titleist Pro V1® golf ball is designed for serious golfers of all levels that demand Tour-validated technology and performance. Featuring an improved, higher coverage 392 dimple design, along with a new staggered wave parting line and exclusive A.I.M. 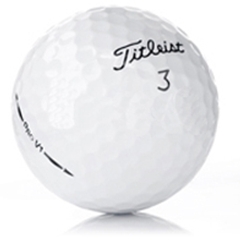 (Alignment Integrated Marking)™ sidestamp, the new Pro V1 golf ball provides long, consistent distance with the driver and long irons, while maintaining soft feel and high performance into and around the green with Drop-And-Stop™ control. Soft and resilient core formulation for outstanding feel and longer driver distance. High performance Urethane Elastomer cover. The core, casing and cover of the Pro V1 comine for low spin off the driver and long irons, soft compression for outstanding feel and Drop-And-Stop greenside control. Higher Coverage 392 dimple design contributes to a penetrating trajectory for long, consistent distance.